Capture critical infrastructure failures that are keeping your build from passing. Request that a successful build be deployed to the next environment. Create a searchable knowledge base of failure causes and solutions. Log time spent on build failures and use Jira Software dashboard gadgets to discover trends over time. When you create an issue from Bamboo, the issue in Jira Software links back to the build result it was created from. 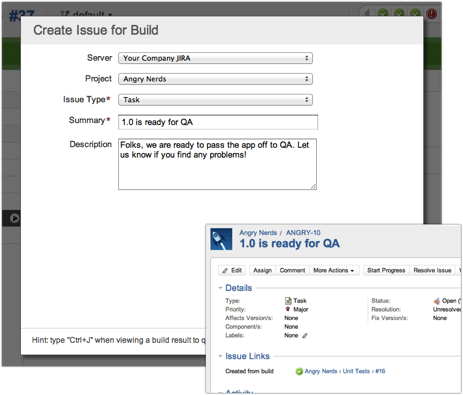 A link to the new issue is displayed in the 'Jira Issues' section of the Build Result Summary, and on the Issues tab, in Bamboo. You require Jira 5.0, or higher. There must be an application link already set up between Jira Software and Bamboo. Your Jira application administrator needs to have enabled fully reciprocal issue linking in Jira Software Server. On the Build Result Summary, choose Actions > Create Issue.